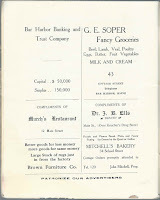 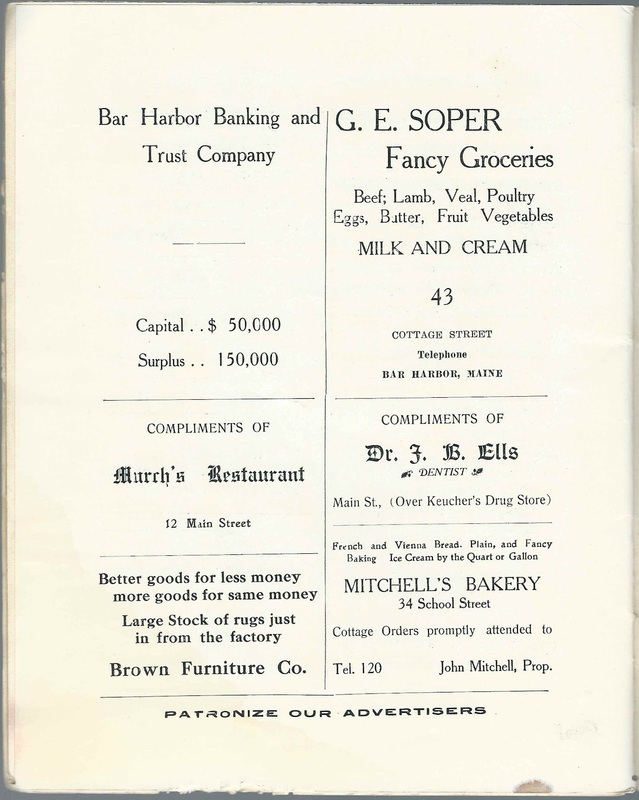 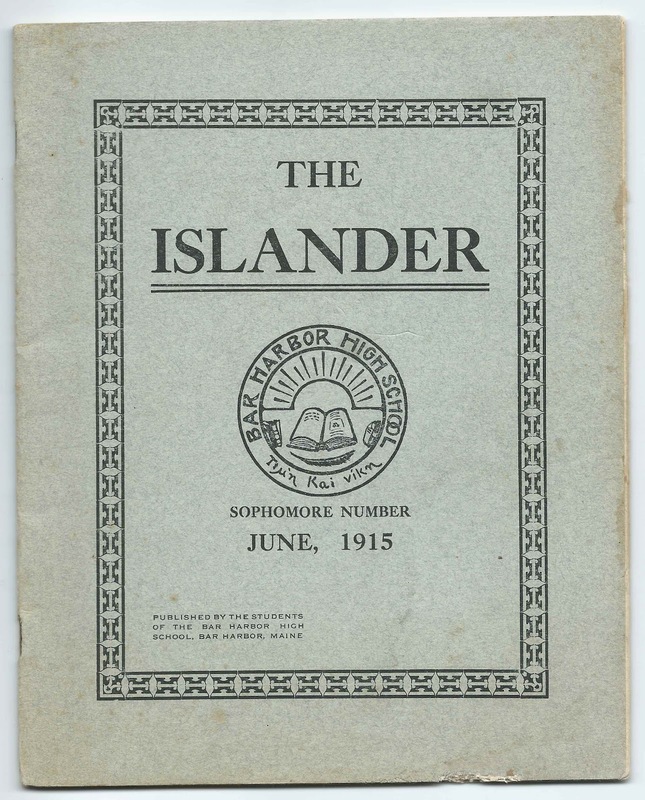 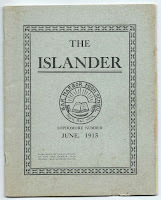 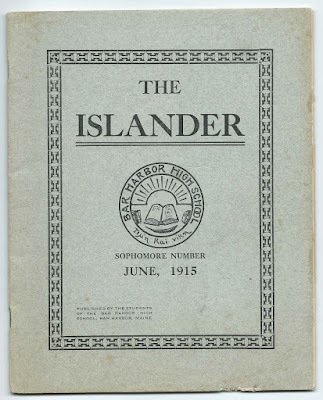 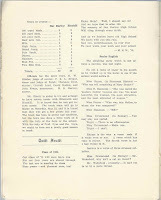 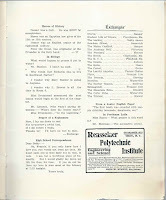 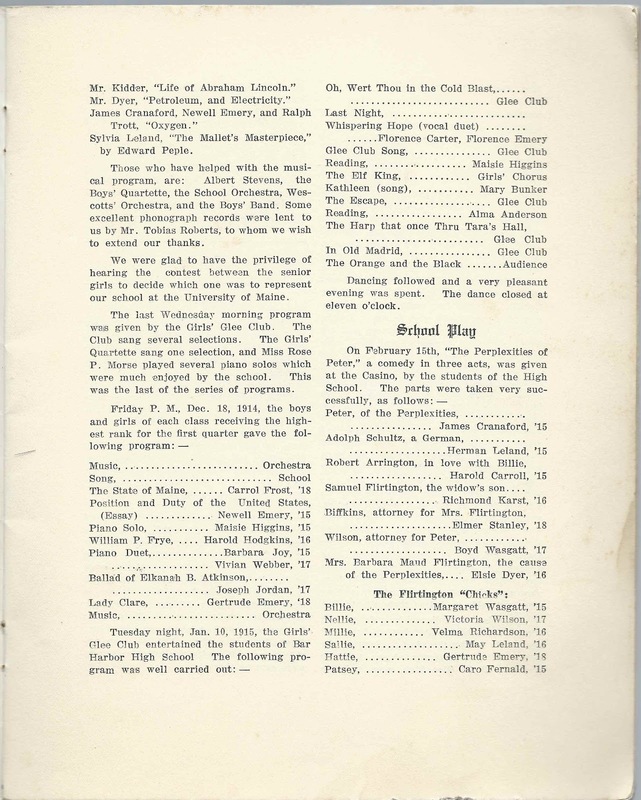 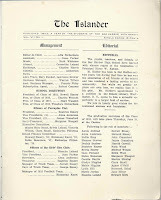 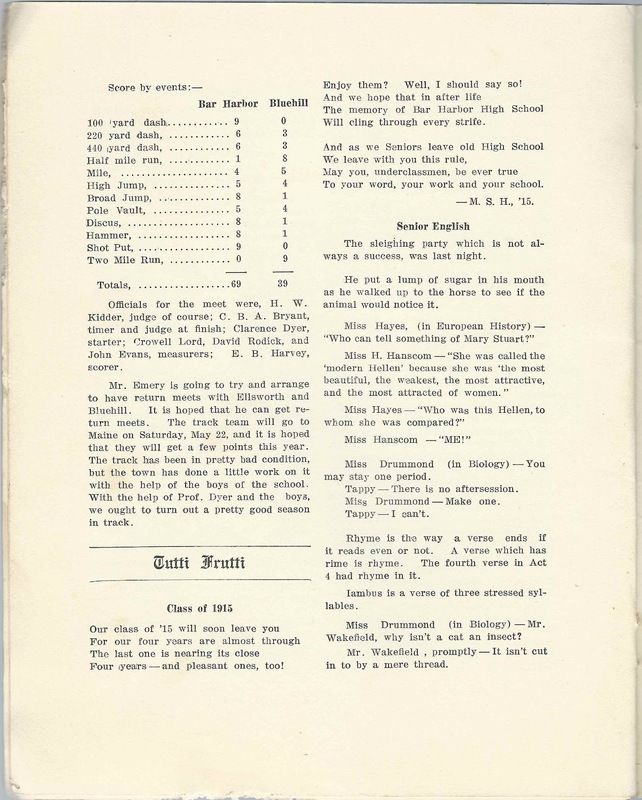 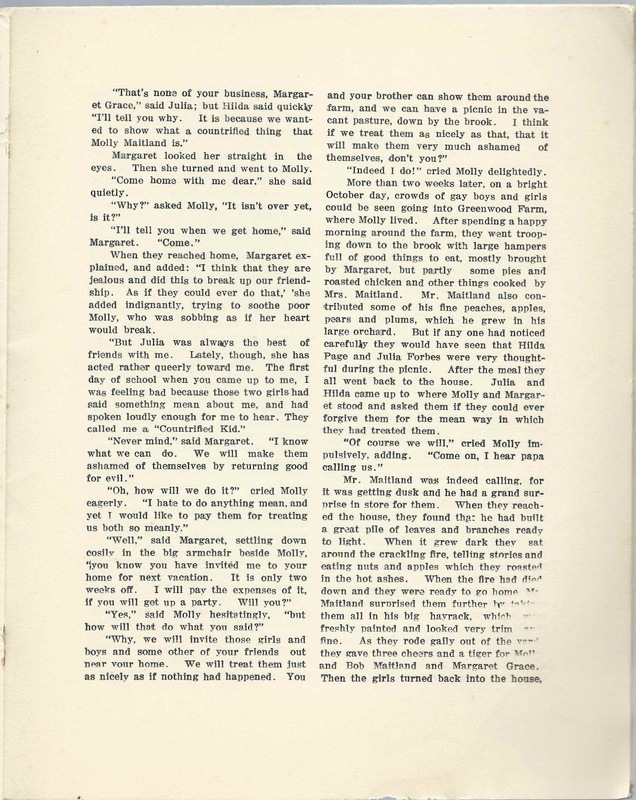 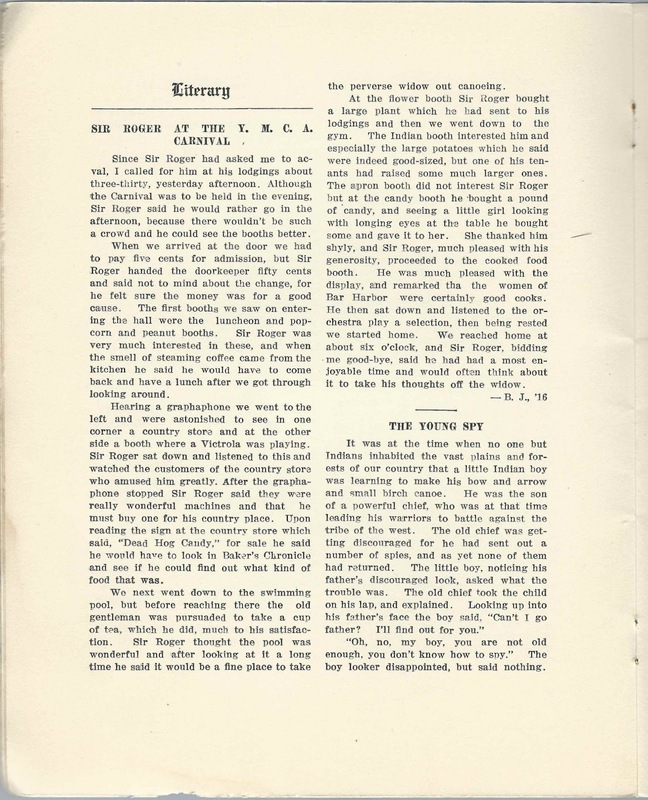 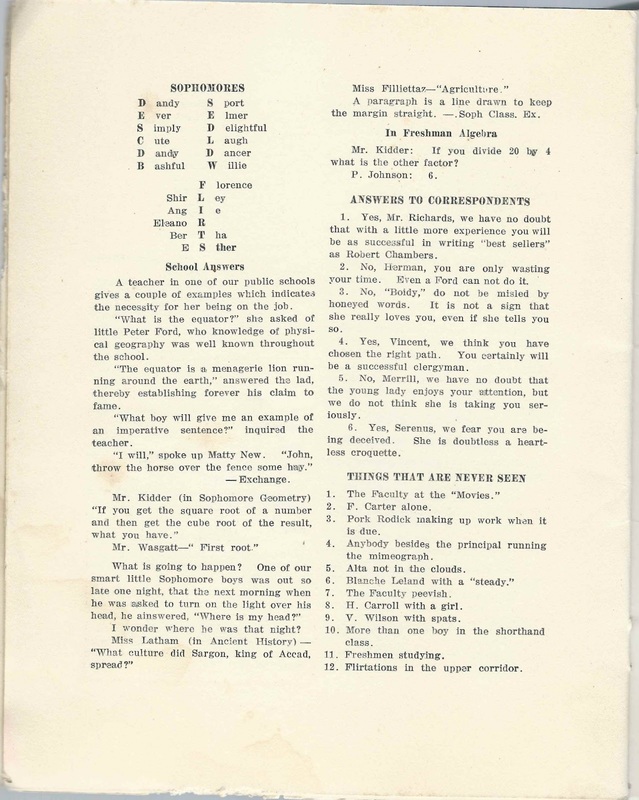 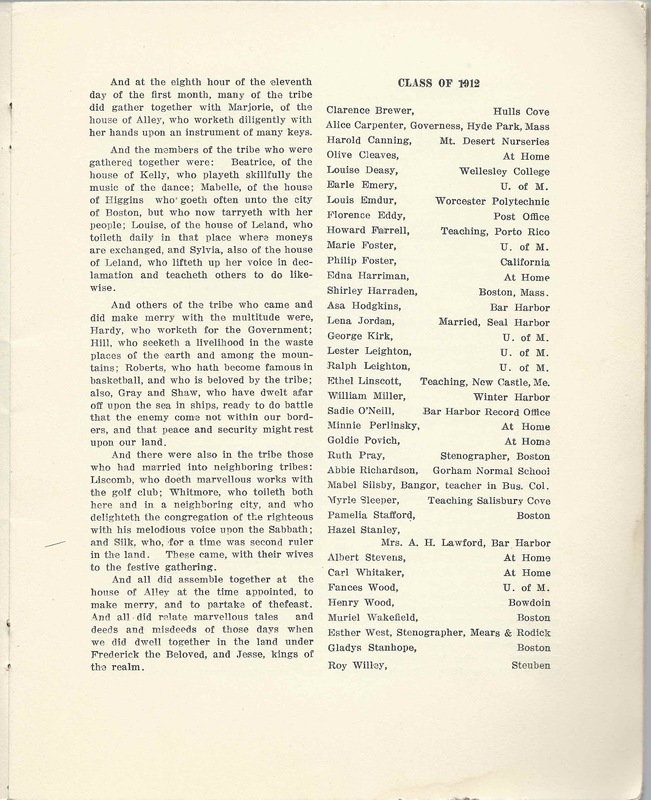 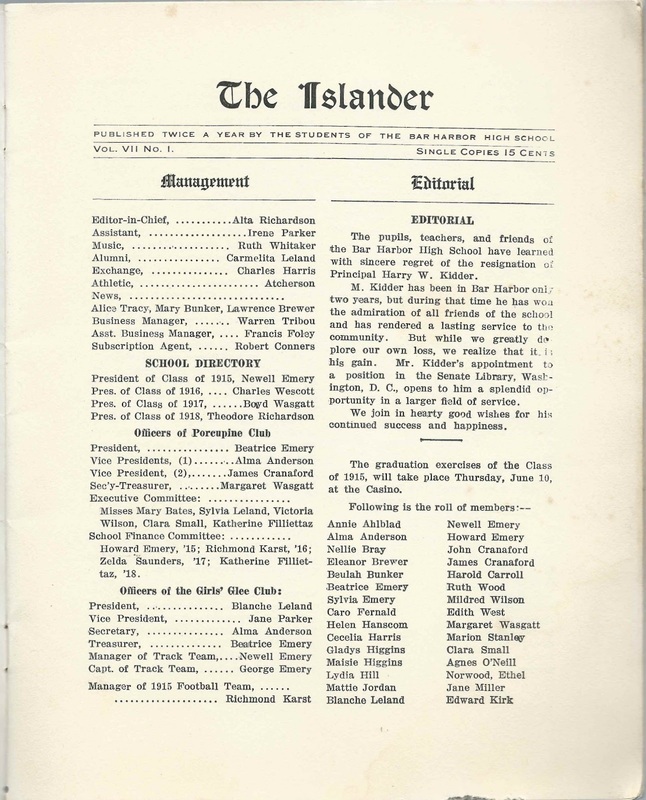 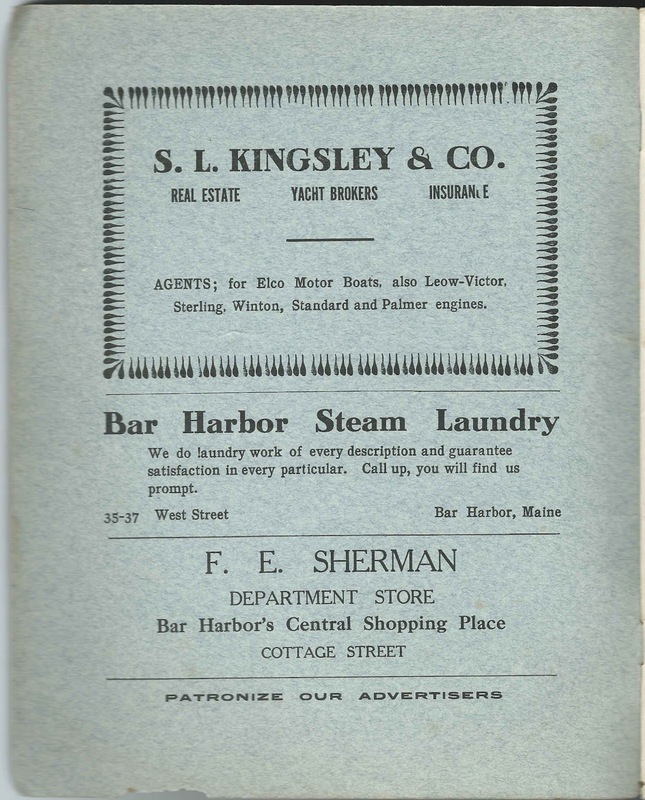 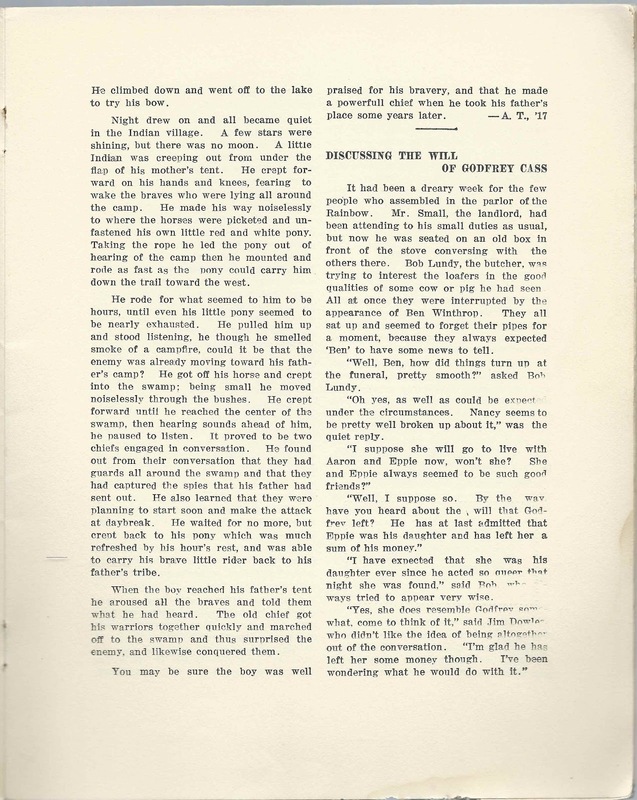 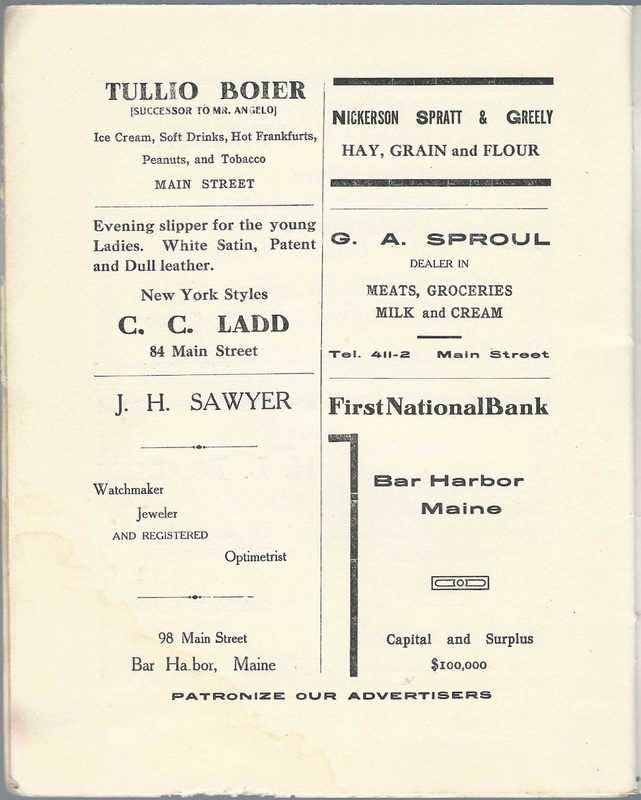 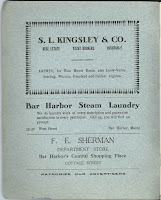 June 1915 issue of "The Islander" of Bar Harbor High School located at Bar Harbor, Maine, on Mount Desert Island. 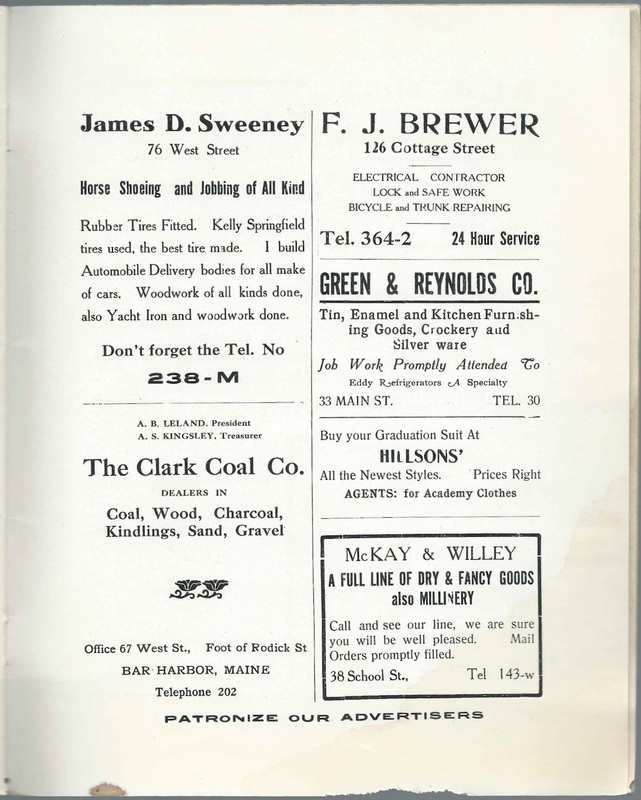 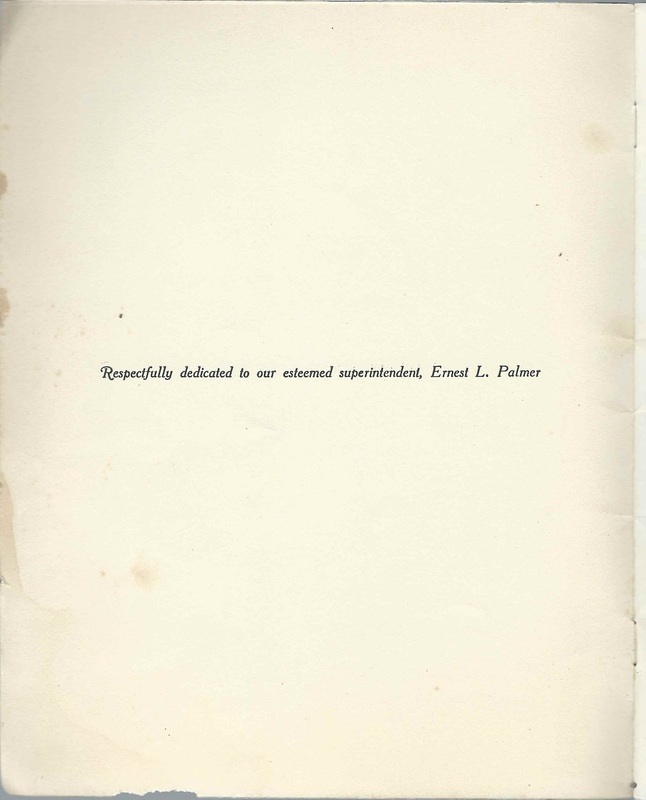 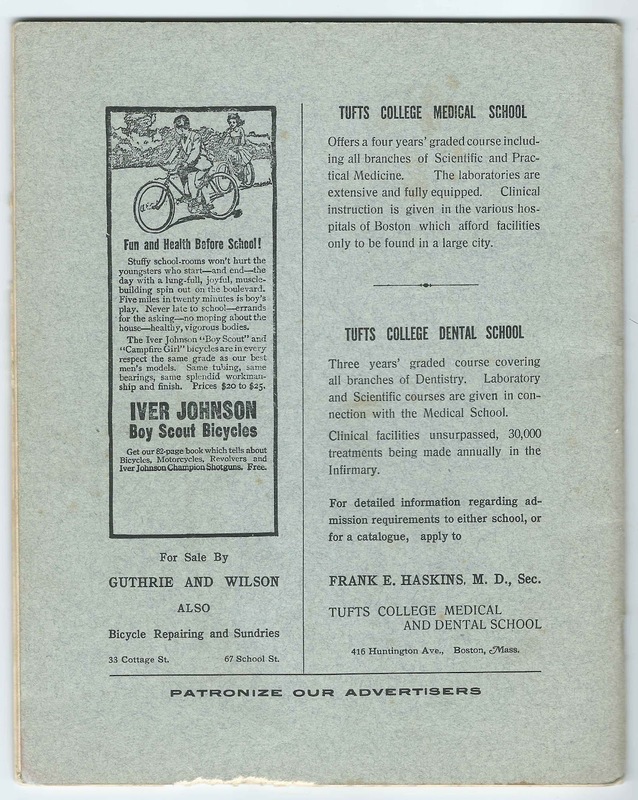 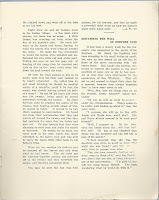 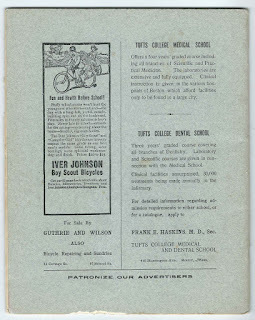 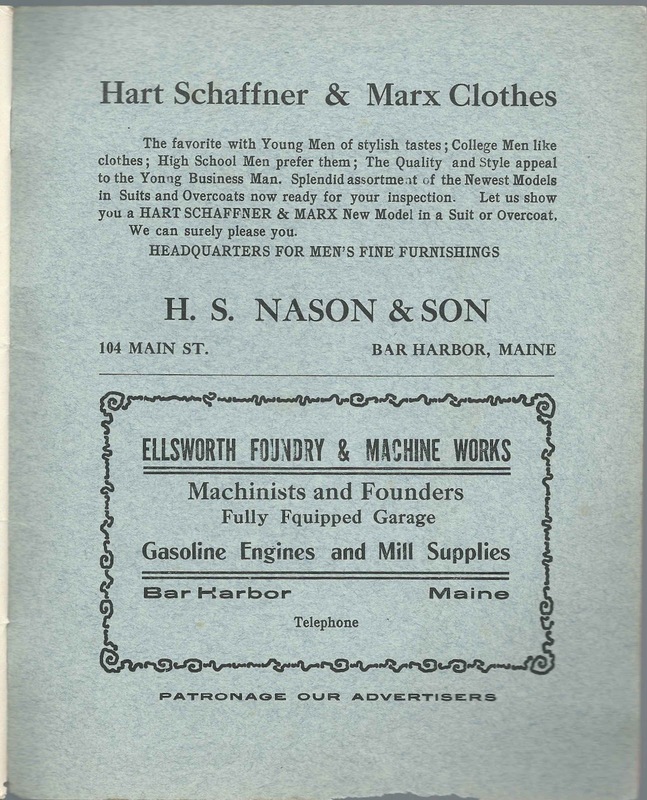 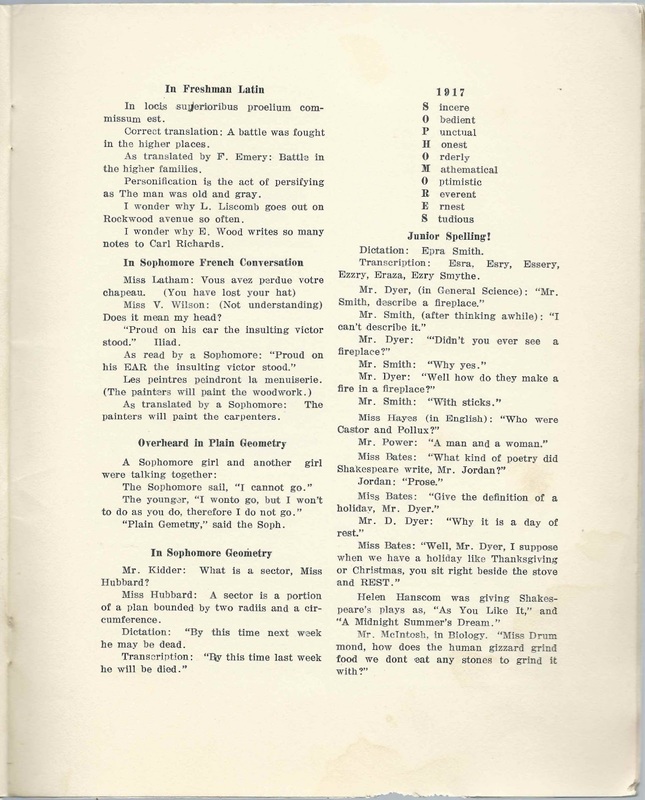 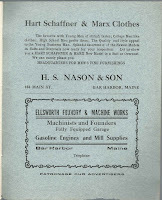 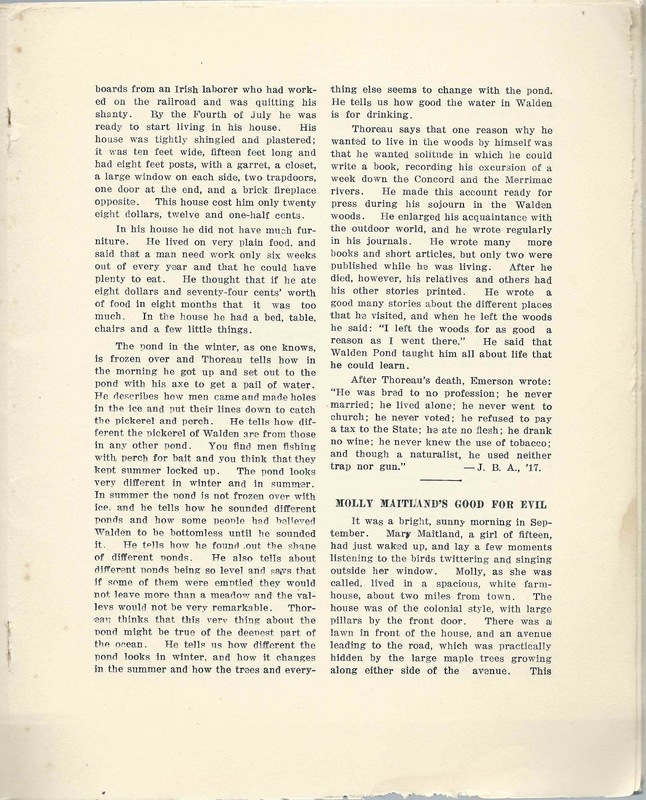 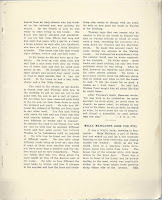 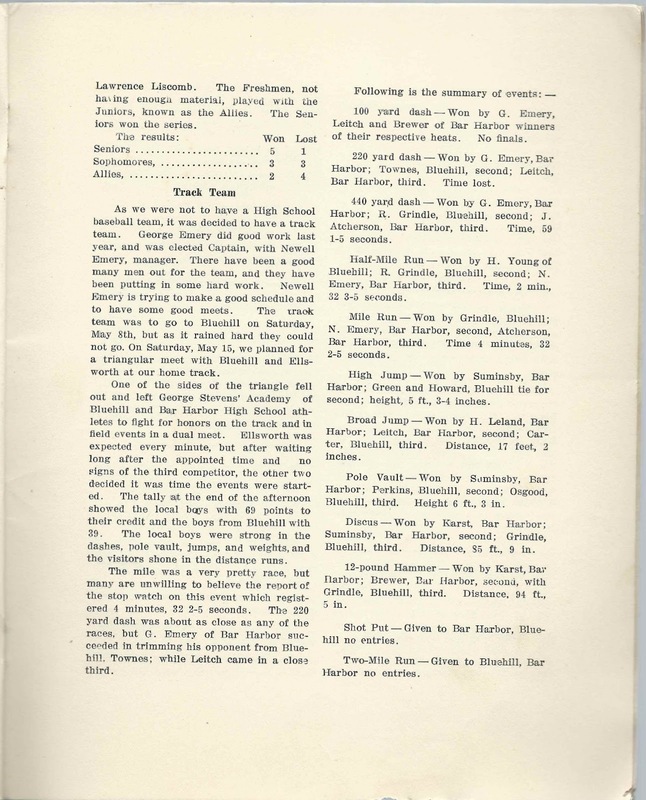 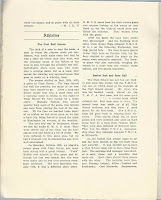 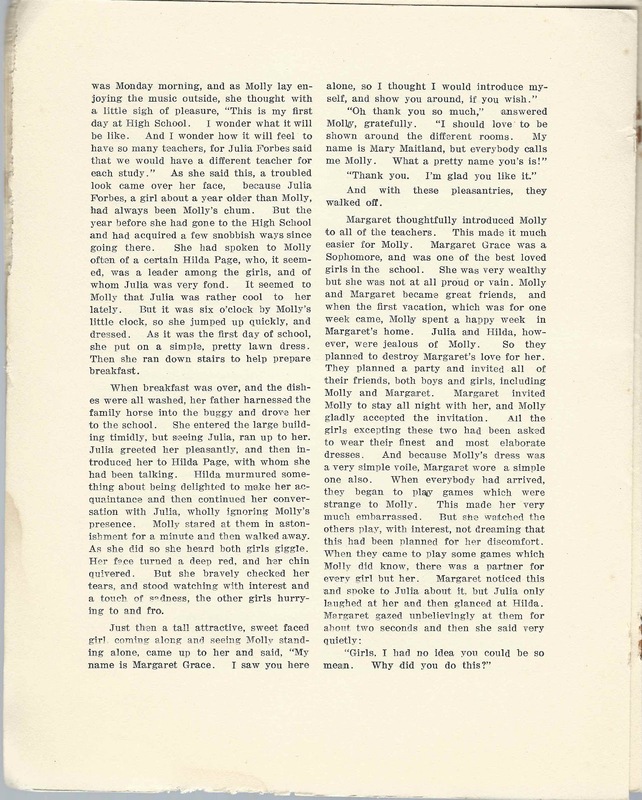 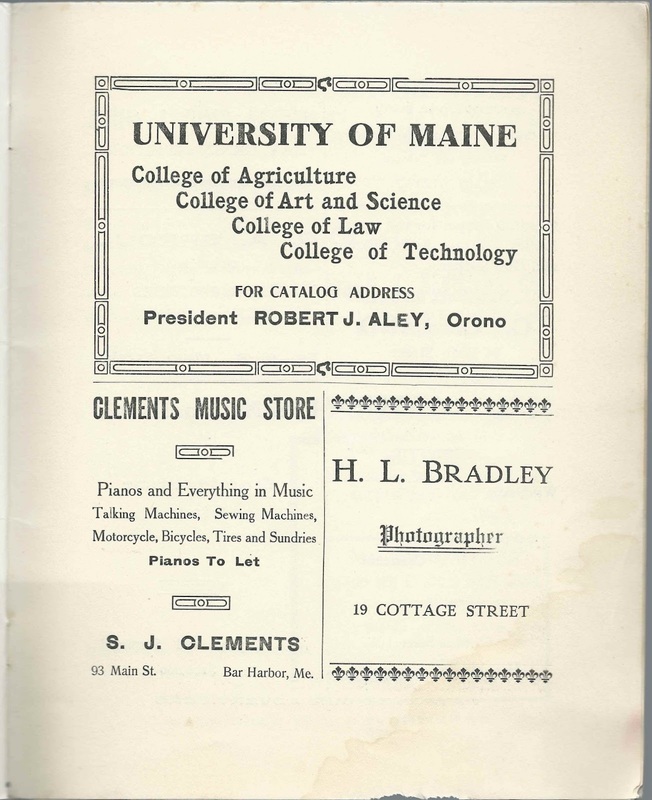 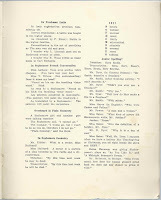 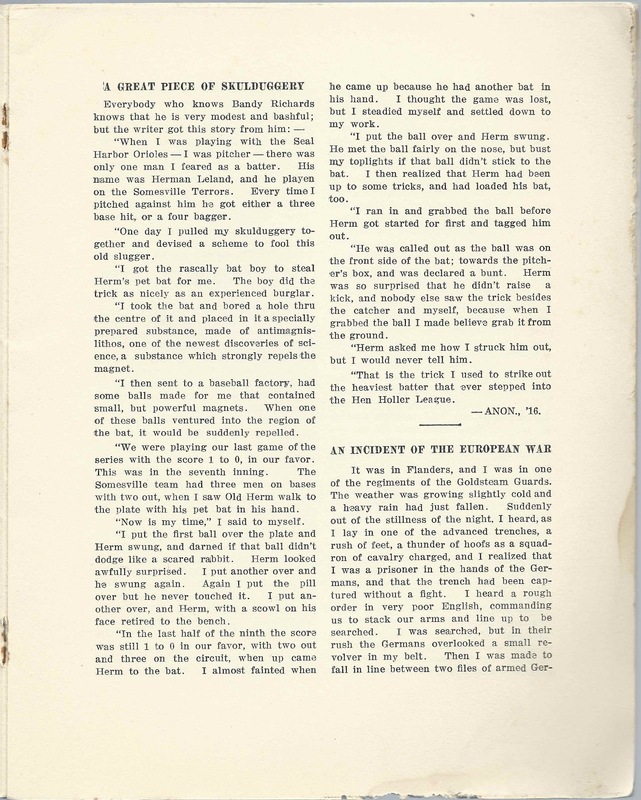 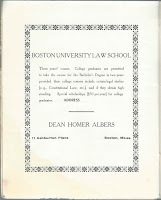 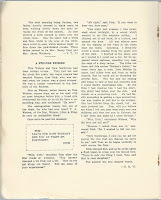 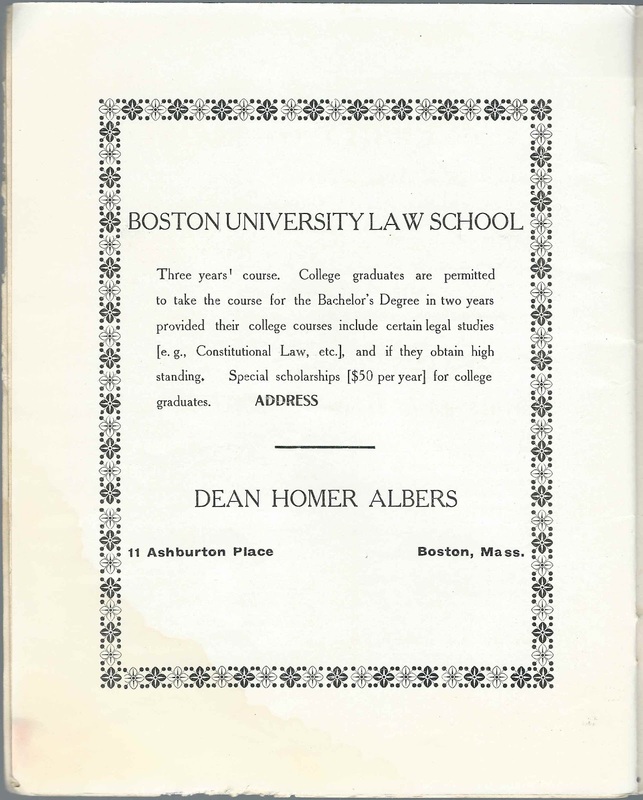 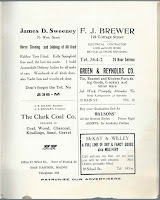 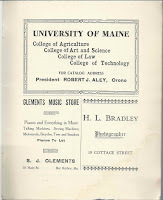 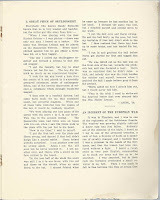 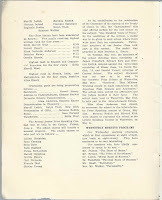 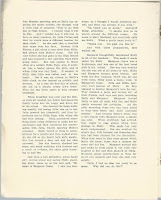 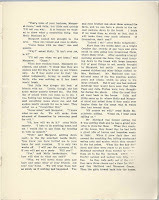 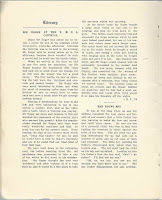 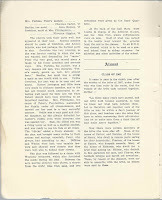 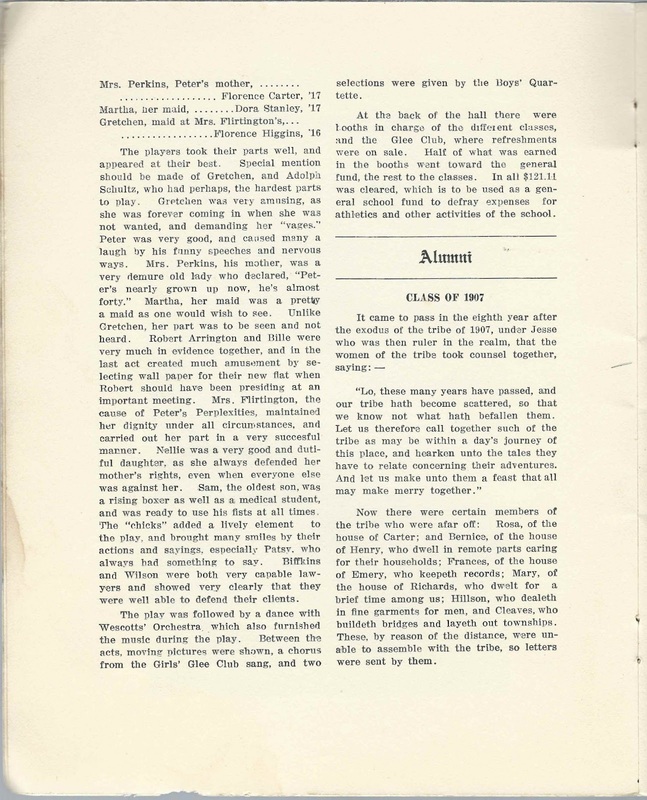 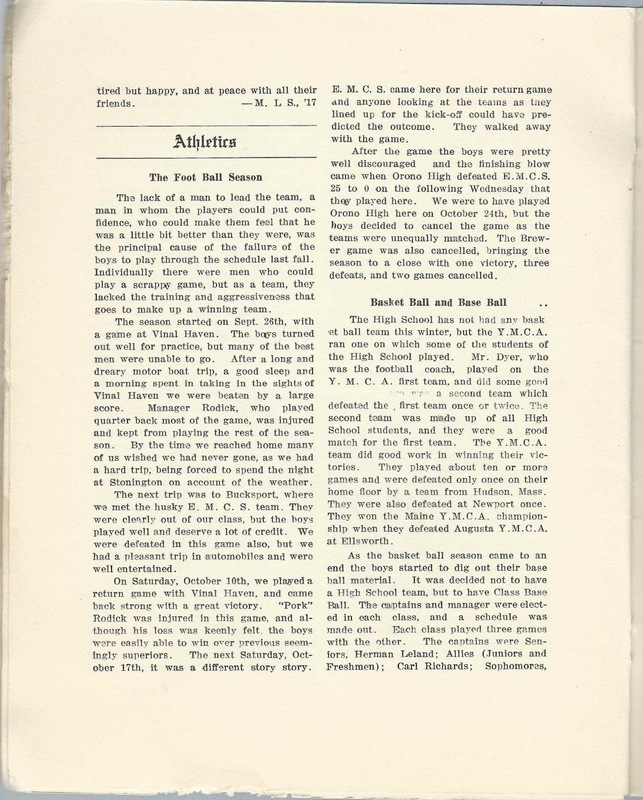 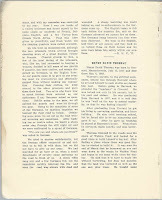 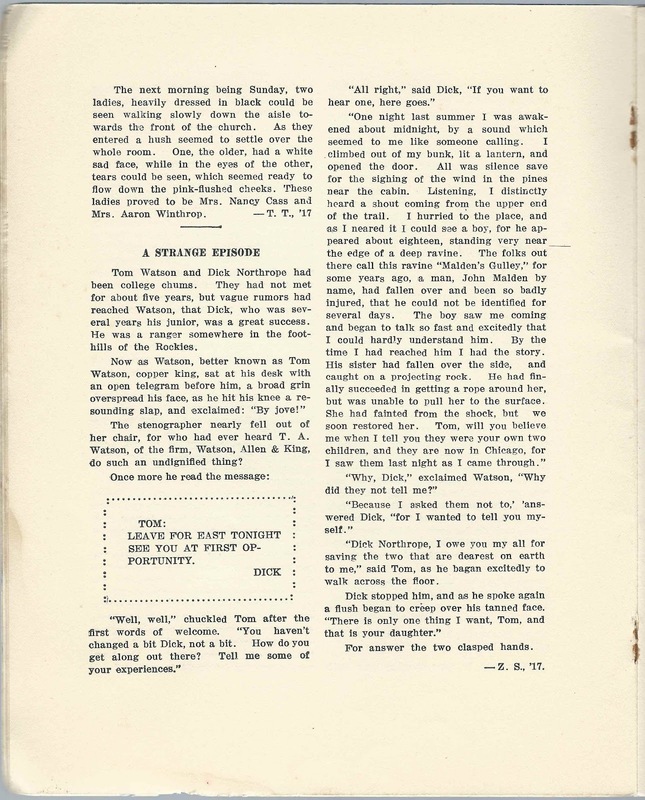 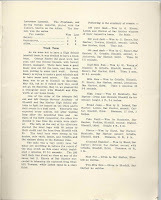 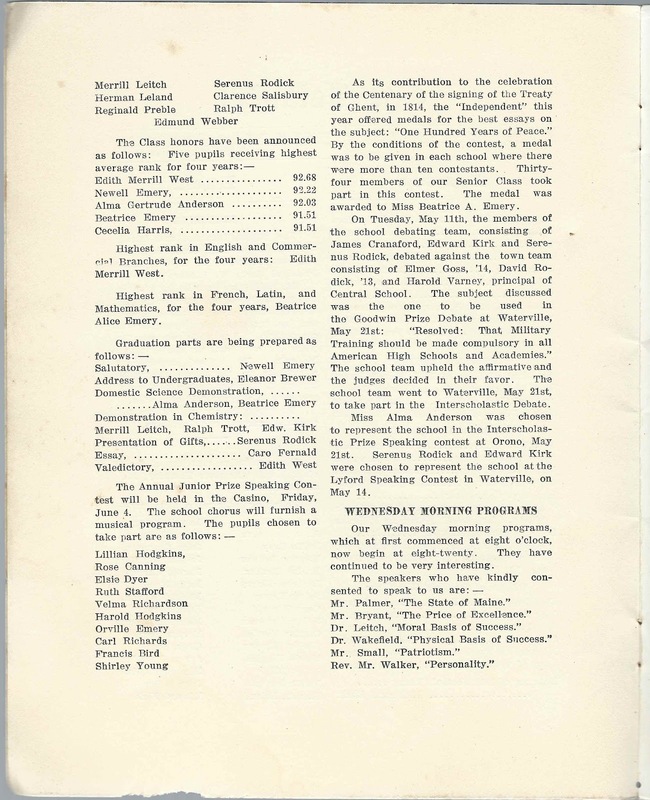 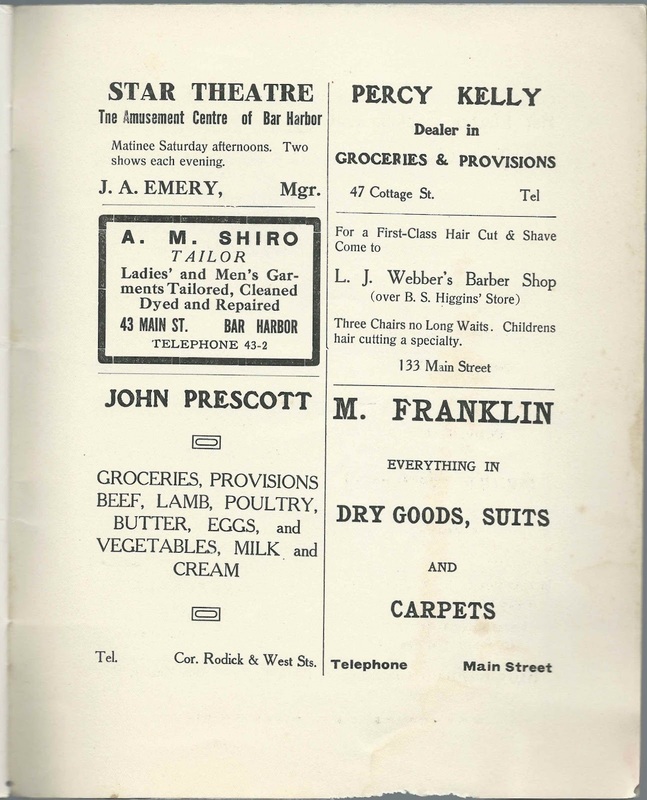 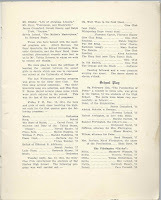 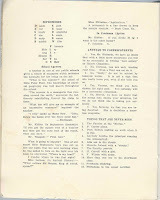 The issue measures approximately 9" by 7-1/4" and contains 32 pages, of which several, in the front and back, consist of advertisements from local business and from institutions of higher learning. 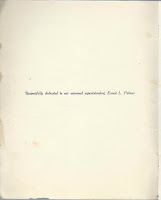 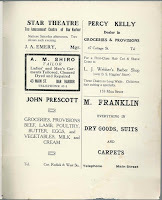 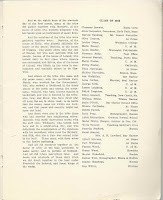 An alphabetical surname list and an alphabetical list of the people mentioned in the issue, including a brief mention of their accomplishments found throughout, appear at the end of this post. 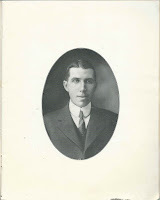 Harold Carroll, Class of 1915; acted in the comedic play "Perplexities of Peter"
Florence Carter, Class of 1917; sang a vocal duet "Whispering Hope", with Florence Emery, at a Girls' Glee Club concert; acted in the comedic play "Perplexities of Peter"
James Cranaford, Vice President of the Porcupine Club; Class of 1915; member of debating team; spoke on subject "Oxygen"; acted in the comedic play "Perplexities of Peter"
Elsie Dyer, chosen to take part in the Annual Junior Prize Speaking Contest to be held at the Casino on Friday, June 4, 1915; acted in the comedic play "Perplexities of Peter"
Gertrude Emery, Class of 1918, spoke on the subject of "Lady Clare" at an awards ceremony; acted in the comedic play "Perplexities of Peter"
Caro Fernald, Class of 1915; graduation part, Essay; acted in the comedic play "Perplexities of Peter"
Florence Higgins, Class of 1916; acted in the comedic play "Perplexities of Peter"
Richmond Karst, Class of 1916, on the School Finance Committee; Manager of the 1915 Football Team; acted in the comedic play "Perplexities of Peter"
Edward Kirk, Class of 1915; graduation part, Demonstration in Chemistry; member of the school debating team; chosen to represent the school at the Lyford Speaking Contest at Orono, Maine, on May 14. May Leland; acted in the comedic play "Perplexities of Peter"
Herman Leland, Class of 1915; acted in the comedic play "Perplexities of Peter"
Velma Richardson, Class of 1916, chosen to take part in the Annual Junior Prize Speaking Contest to be held at the Casino on Friday, June 4, 1915; acted in the comedic play "Perplexities of Peter"
Serenus Rodick, Class of 1915; graduation part, Presentation of Gifts; member of the school debating team; chosen to represent the school at the Lyford Speaking Contest at Waterville, Maine, on May 14. 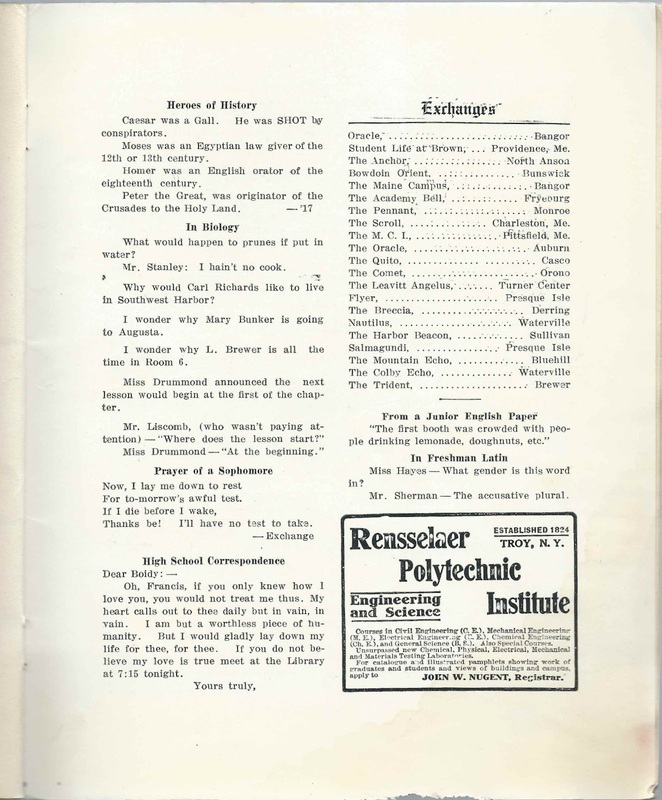 Elmer Stanley; acted in the comedic play "Perplexities of Peter"
Dora Stanley, Class of 1917; acted in the comedic play "Perplexities of Peter"
Ralph Trott, Class of 1915; graduation part, Demonstration in Chemistry; spoke on subject "Oxygen"
Boyd Wasgatt, President of the Class of 1917; acted in the comedic play "Perplexities of Peter"
Margaret Wasgatt, Secretary Treasurer of the Porcupine Club; Class of 1915; acted in the comedic play "Perplexities of Peter"
Victoria Wilson, Class of 1917; on the Executive Committee of the Porcupine Club; acted in the comedic play "Perplexities of Peter"
My great grandfather was richmond karst. I never have seen a picture of him . 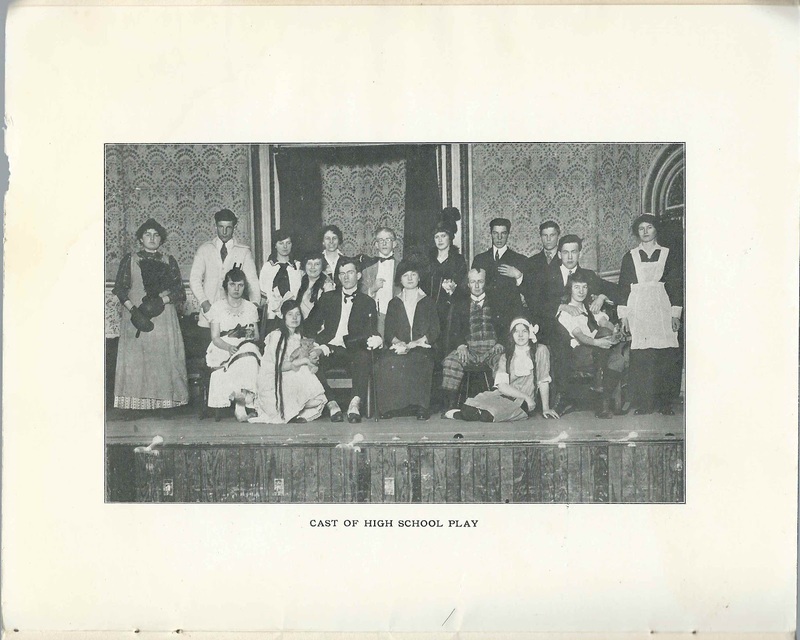 Then I saw this just wish I knew which boys was hom in the play. 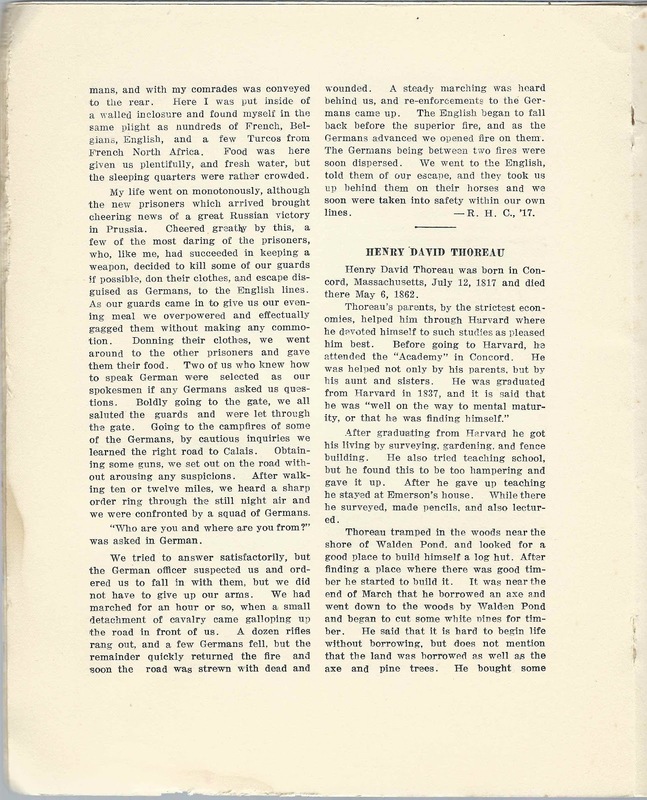 Seems he was manager of the football team - maybe there is another issue - from 1914 and 1915 - of this publication that might have more info on the football team and, perhaps, a photograph. 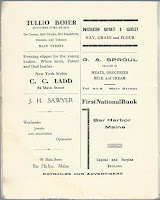 The library or historical society in Bar Harbor might have some issues.